Hey friends! I am so excited for today’s post because today marks the second week of the 4 week declutter and organize your home challenge. Week one started with our kitchens, week two, we moved onto our craft and office spaces, and today, we are moving on to our bathrooms. This challenge is hosted by myself and the rest of my friends from No Place Like Home. I have been really getting into this whole declutter and purge thing. I have been trying to make some difficult choices to clear the clutter in our spaces. 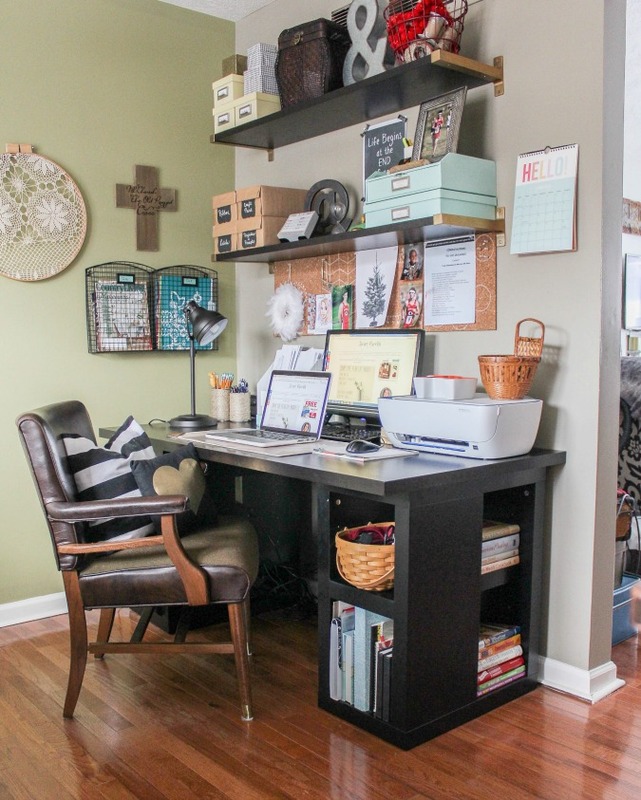 Not only do we have some very useful tips and tricks for you to help you get your office and craft spaces organized, but we are hosting both a link party and a giveaway for a $150 Container Store gift card! We invite you to please link up your kitchen, craft, and office organization, or bathroom organization posts, or if you do not have a blog, you can just link up a picture if you like, and then be sure to enter to win the gift card! And please mark your calendars so that you can be sure to join us for the rest of the month, when we will focus on a different area in our homes each week. 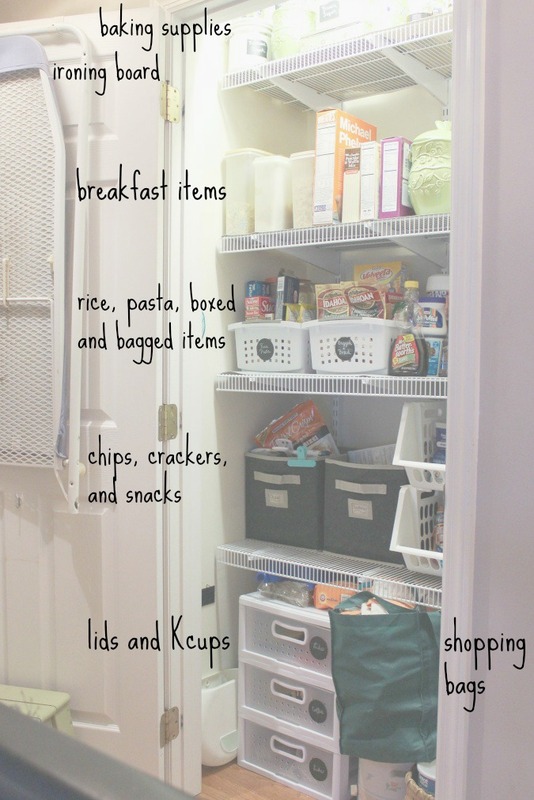 Also, please be sure to visit each of the other hosts at the links below to see how they have organized and decluttered their spaces! 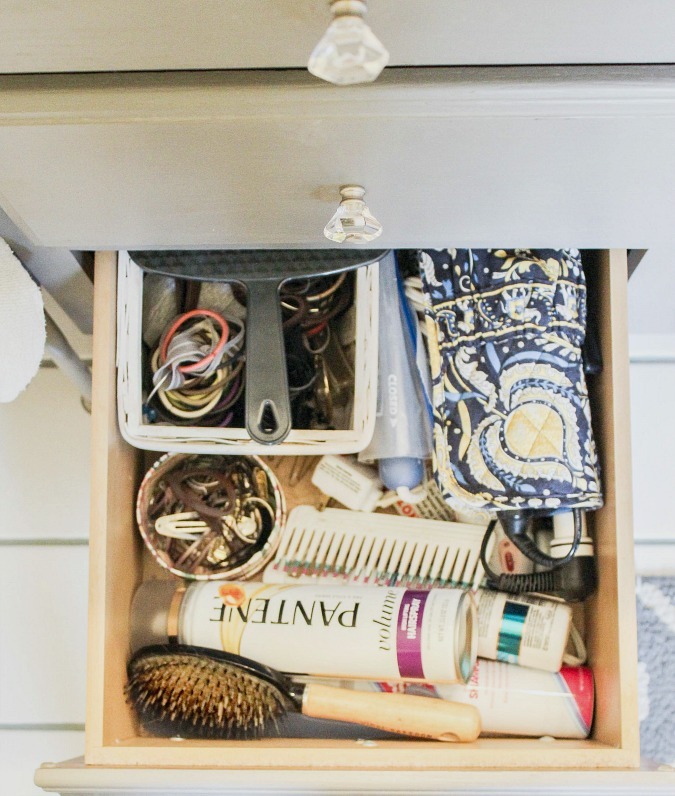 It has only been about a year or so since I did a declutter and organization project in my master bathroom, and the system I have in place is still working wonderfully! The pictures you are seeing here today are not staged. They are real pictures of the state of my bathroom cabinets and drawers. I didn’t even do another purge because I got rid of so much junk last winter and have done a pretty good job of keeping things organized and not collecting more junk. 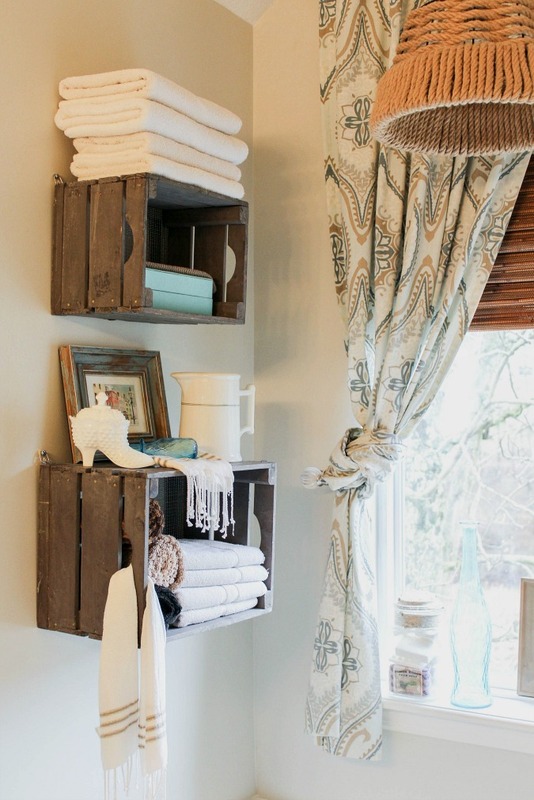 One of my favorite storage related additions to this bathroom has been the crates we hung on the wall that you see above. I think they are so cute, plus they are fabulous for adding storage to your space. I found these at HomeGoods. I store our bath mats and towels here, which cleared out an entire shelf that is now being utilized for cleaning products.I found this large jar at Goodwill a few years ago and decided to use it as an apothecary jar. You can read about the little spruce up I gave it here. But I unwrap all of my bars of soap when I bring them home and store it in this jar. Just in case you are wondering, my soap of choice is Ivory. That is basically all I use when it comes to a bar of soap. Our bathroom has been a work in progress for some time now. I still have a couple of projects to finish up in here, but you can click here to see the latest in our bathroom. 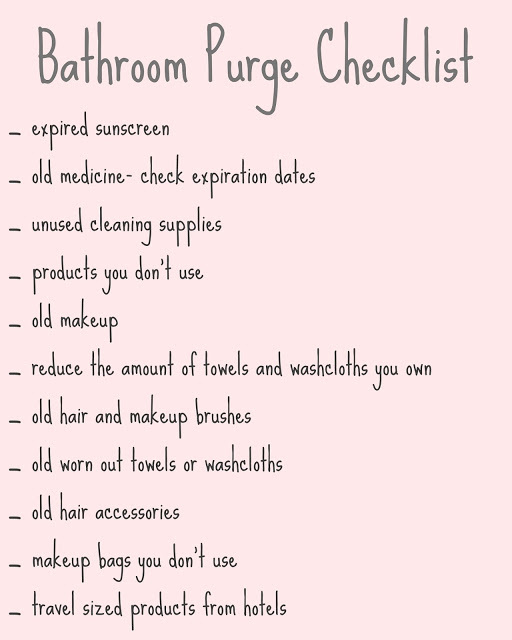 Below are some tips that might help you get started in purging your own bathroom. I literally went through everything we had in ours and got rid of so much stuff! This little mesh basket was a gift from my intern last Spring, and I am using it to hold bathing items that I use every day. 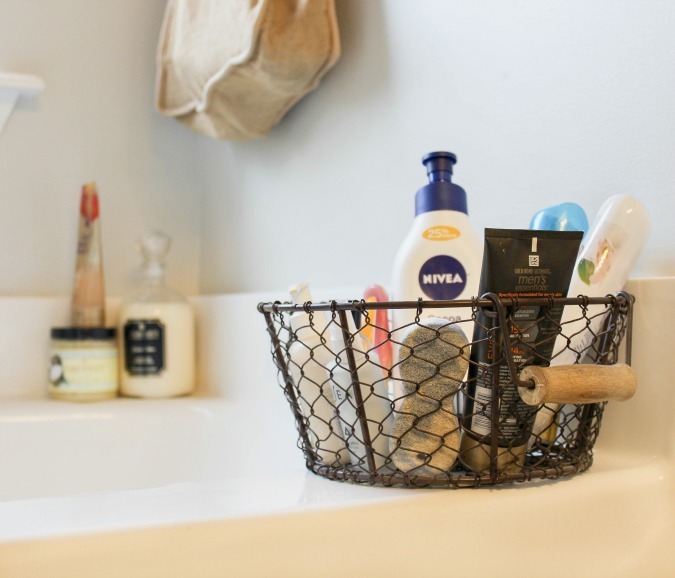 I think this wire basket is really cute, and it is easy to hide if we are having company and I don’t want all of my products sitting out in the open. I also sometimes remove them for a photo shoot. So this little basket makes them portable, which I love. My husband and I both love to take baths, so it is nice to have our daily products within reach. You might notice in the background the pretty glass bottle of bubble bath. I found it at Marshalls and bought it just for the bottle. I plan to keep refilling it and using it for a long time. I might change out the label on it once this bubble bath is gone. This small cabinet that hangs over our toilet holds all of our perfume and cologne. I am aware that some people say not to store perfume in the bathroom, but I have been doing it for years, and it hasn’t changed the fragrances. It is very convenient to keep it in the bathroom and this is an easy place to grab what we need and mist a little on before heading out. I love perfume, and you are getting a glimpse here of my favorites! 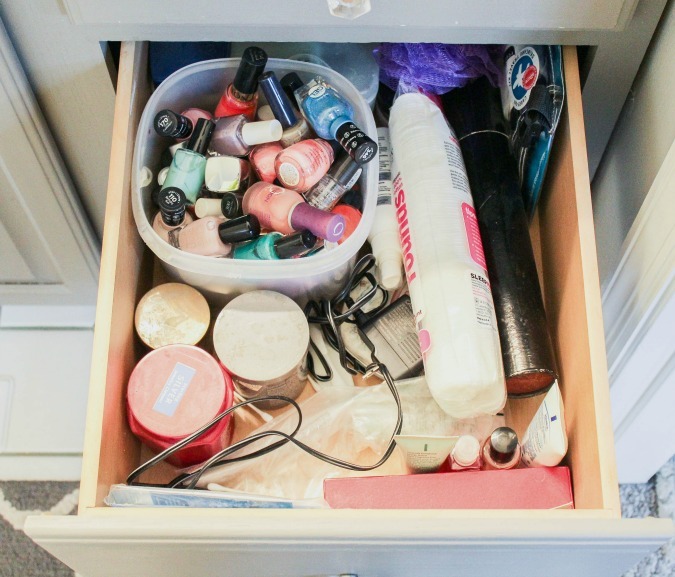 When we moved in to this home, this cabinet was the only storage in this bathroom, so you can see why I had to get creative, because one cabinet is just not enough for this girl! I have utilized every inch of this space in this cabinet. Keep reading to see how! 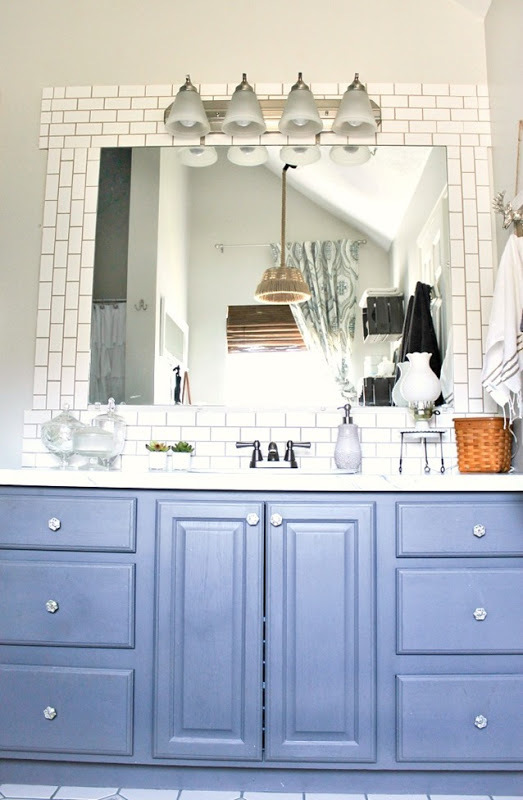 You can read about my bathroom vanity makeover here and my DIY subway tile wall here. This is the center cabinet of the vanity. On the left is a shelf that I picked up at Goodwill, and it used to hang on the wall, but it fit perfectly into this space, so I am now using it inside the cabinet. 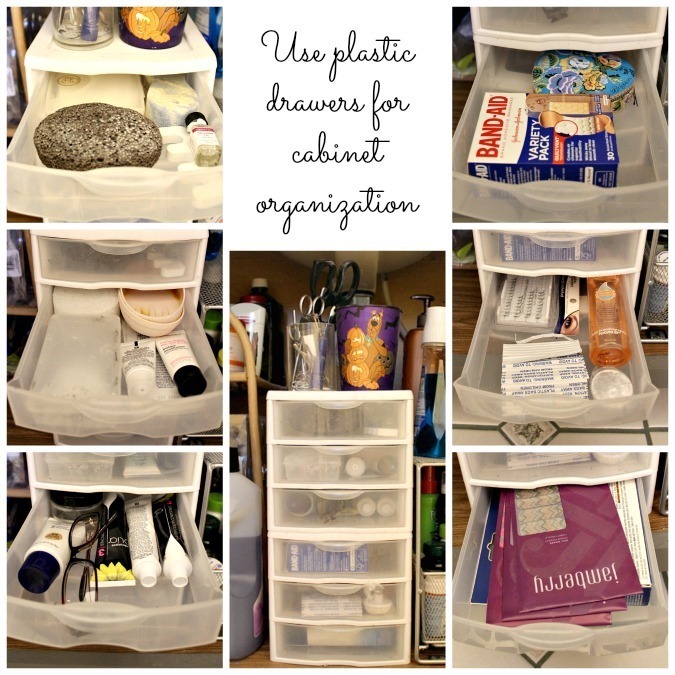 These plastic drawers are so wonderful to use in this space because it holds so many little odds and ends! And the mesh shelf slides out like a drawer, so I love that. Next up, here is a peek into each of my drawers. These drawers are fairly large and deep, so I was having issues with things sliding around when I opened and closed them. My solution was to try to fill the entire space with small containers to divide the space up into compartments. I bought most of these little baskets at Target in the dollar spot. And they completely solved my problems with things sliding around. 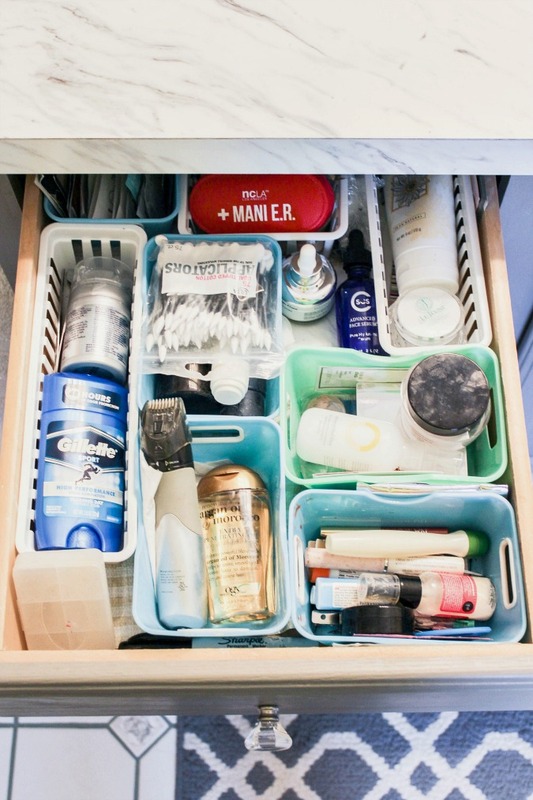 The things in this drawer are used virtually every day. 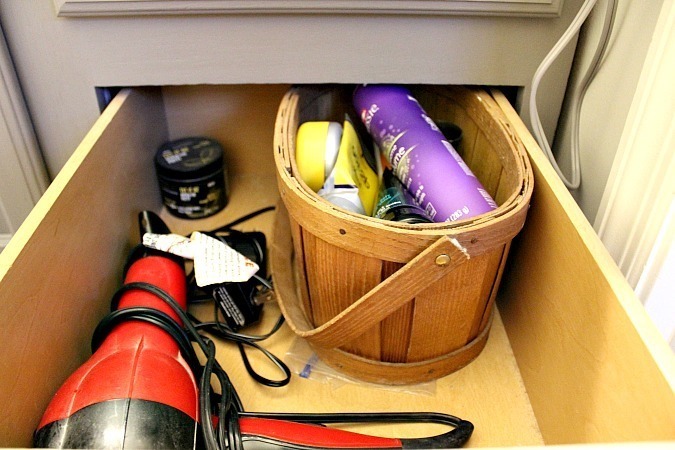 This drawer contains things I use to fix my hair. Curling irons, flat irons, hair accessories, brushes and combs, and my hair products. It is easy to find what I need. 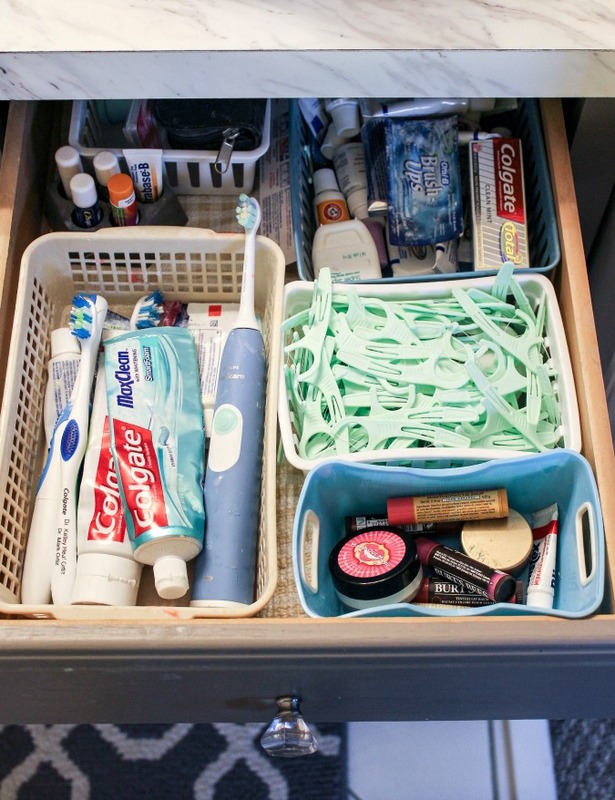 This next drawer contains dental hygiene items. And in case you haven’t discovered them yet, these little flossers are so much better than regular dental floss! My husband and I both love them! I keep my fingernail polish in this giant plastic bowl, and have for years. I actually went through all of my nail polish last winter and got rid of everything that was dried up. 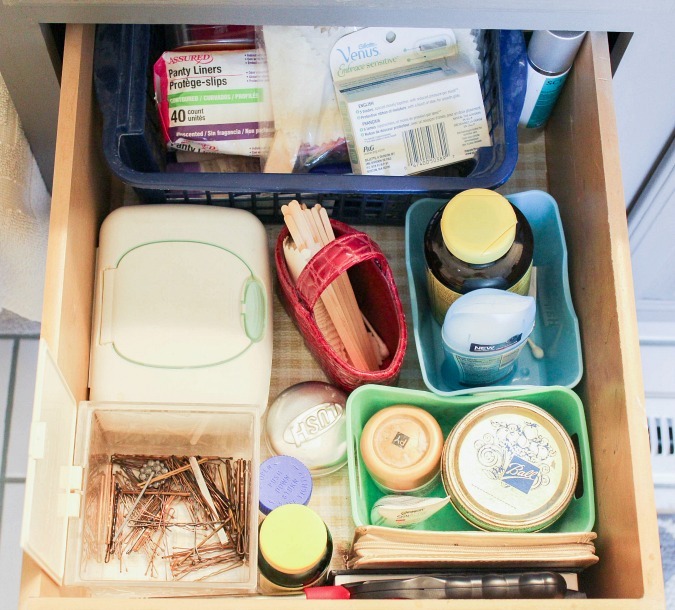 The rest of this drawer is kind of a mish mash. Jewelry cleaning products, matches, extra shower sponges, chargers, and some travel items. This drawer contains our hair dryer and my husband’s hair products. I like to separate our products. It seems to simplify things for us both. 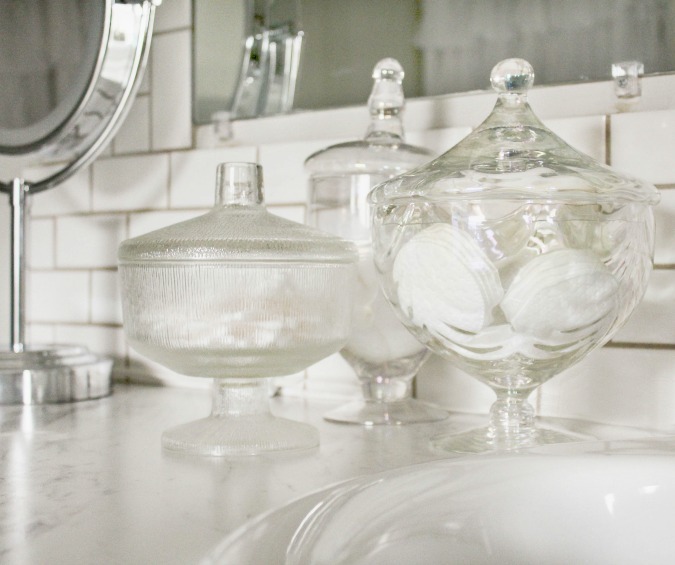 These glass containers look pretty on the counter, and they house our cotton rounds (which I cannot live without for eye makeup removal), cotton balls, and Qtips. 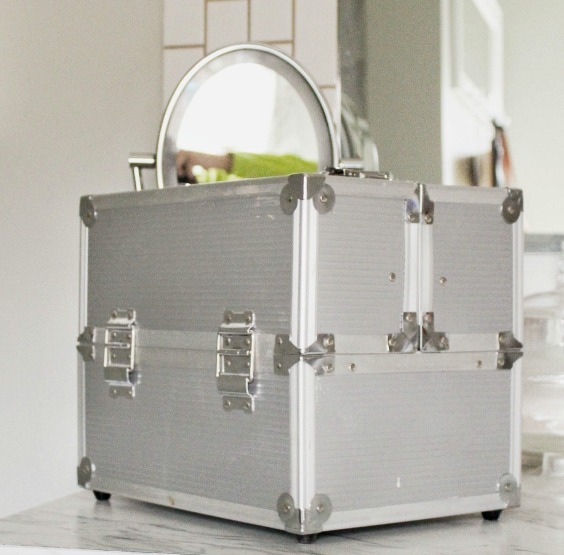 I don’t believe I have shared this last piece on the blog before, but I wanted to share my makeup case with you. This is where every bit of makeup is kept. I bought this several years ago, and it was kind of a splurge for me, but it is wonderful. Although I must admit, it is the one part of my bathroom that could probably use a good purge. But it’s OK with me because no one ever sees inside but me! I keep this sitting right behind our bathroom door on the floor. No one really ever sees behind it but my husband and I, so it works. 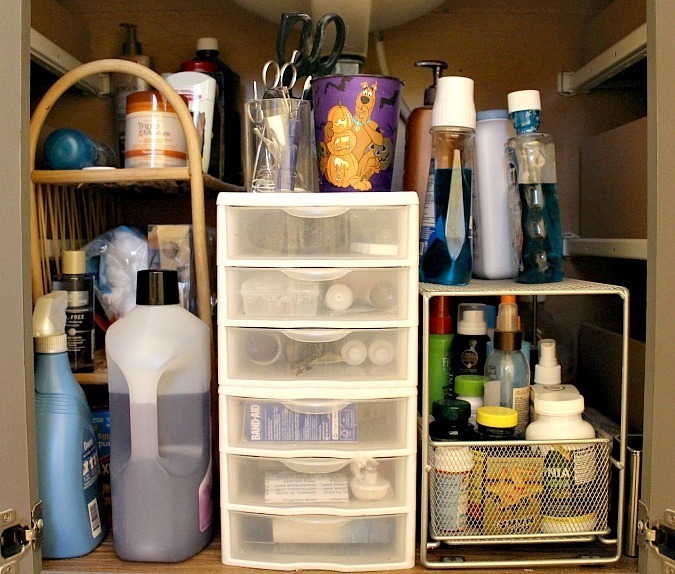 When was the last time you decluttered and organized one of your bathrooms? Do you have any awesome tips to share? 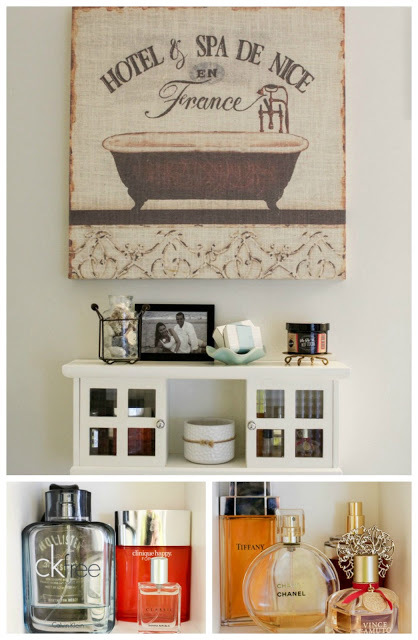 We would love to have you link up any of your bathroom organization posts you have written at the linky party below! We hope you are being inspired to organize your home with this series! 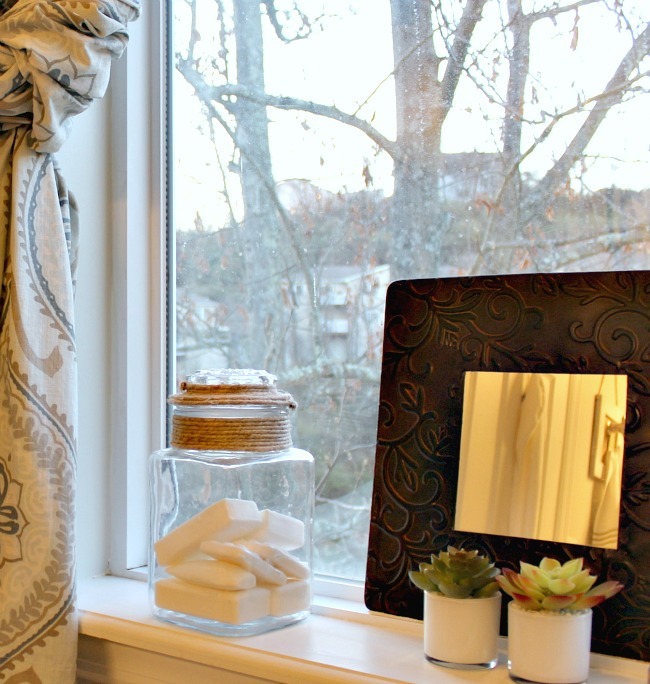 Thanks for stopping by, and we will be wrapping up our challenge next week with storage closets, and I gave our linen closet a mini makeover! I am excited to share it with you guys! Don’t forget to enter win the giveaway if you haven’t already! Enjoy your weekend! If you like it then you wanna put a pin on it! 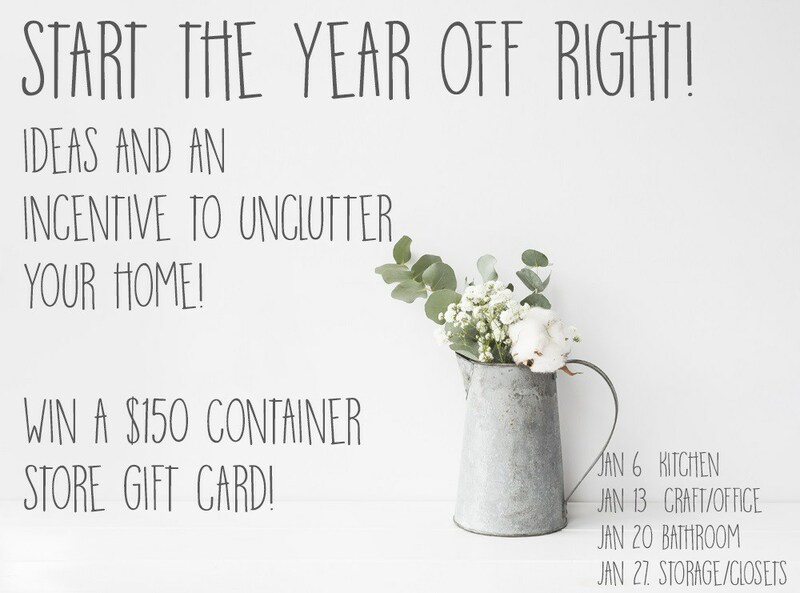 Share your decluttering successes with us and earn an entry for an $150 gift card from The Container Store! Come back each of the 4 weeks to earn 4 entries!